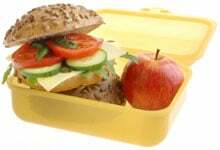 Bringing your lunch to work or school is a great way to save money, curb calories and reduce the amount of to-go packaging with your name on it. Make lunchtime even greener by stashing a durable place setting in your desk or locker. Need to reheat last night’s leftovers or assemble that PB&J? Pass on paper plates and use your own rewashable one. This goes for silverware too. By washing and stashing your own lunch accoutrements, you could save 300+ plastic plates, forks, etc. per year!